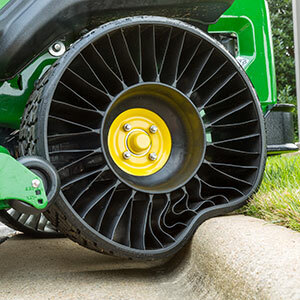 The Michelin X Tweel Turf airless radial tire is now available for standalone purchase at John Deere dealers. The Michelin X Tweel Turf airless radial tire is certified for use on John Deere Z900 E-, M- and R-Series gas-power mowers with 54-, 60- and 72-inch decks. The Michelin X Tweel Turf airless radial tire has the same dimensions and bolt pattern as a standard 24-by-12-by-12-inch tire and features automotive rubber technology, which allows the tread to last up to three times longer than standard turf tires, John Deere said.